The swelling price tag for the United States offensive against the Islamic State has surpassed $8 billion, according to the Pentagon. 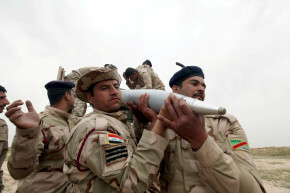 American taxpayers shelled out the hefty sum through June 15 for the military to battle the jihadist group across Syria and Iraq, according to new statistics released by the Department of Defense. The average daily cost of the campaign is now $11.8 million a day, a 28 percent increase from the $9.2 million daily average from a year ago. That’s a burn rate of $8,206 a minute since the Obama Administration initiated airstrikes against ISIS in August 2014. The military offensive has yet to receive authorization from Congress. The latest figures come as a U.S.-led coalition of forces continue to push toward ISIS’ diminishing self-declared caliphate. Relentless American airstrikes aided a group of Syrian opposition forces who last week recaptured Manbij, a strategic city held by ISIS that once served as a gateway to Turkey’s border. Iraqi government forces, who are backed by U.S. warplanes and special forces, are currently preparing a military campaign to recapture Mosul, Iraq’s second largest city, from ISIS, which the jihadist group seized in 2014. Overall, U.S.-led warplanes and drones have now unleashed more than 50,000 bombs and missiles against ISIS targets in Syria and Iraq, Vocativ reported last week. According to recent Pentagon figures, these airstrikes have damaged or destroyed more than 26,000 strategic targets, including ISIS buildings, tanks, and oil infrastructure. These bombs and missiles, however, have also inflicted a devastating toll on civilians living under ISIS rule. Airwars, a monitoring group, estimates that at least 1,513 civilians have been killed by weapons deployed by coalition warplanes through July 24, a figure far greater than the 41 civilian deaths acknowledged by the Pentagon to-date. There is also a growing concern among federal law enforcement that the jihadist group’s defeat in Syria and Iraq could spell trouble for Europe and the United States. FBI Director James Comey on Thursday warned that ISIS fighters who survive the battlefield may soon flow into western Europe to try and carry out attacks. The ease of travel, he said, could also prove problematic for the U.S.
by the Department of Defense. The average daily cost of the campaign is now $11.8 million a day, a 28 percent increase from the $9.2 million daily average from a year ago. 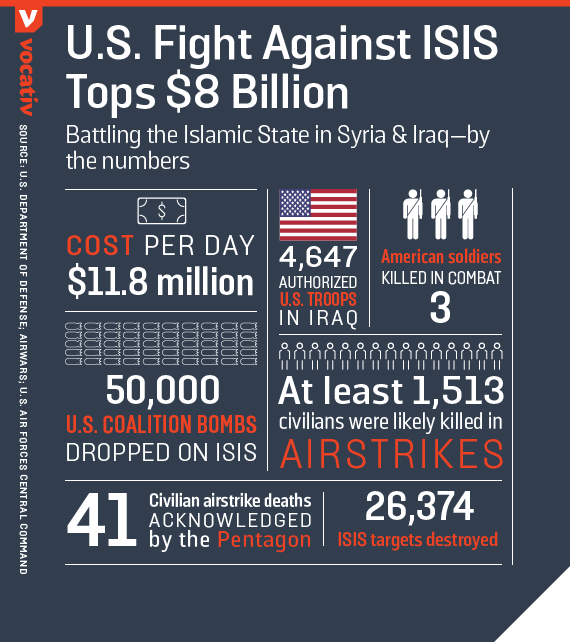 That’s a burn rate of $8,206 a minute since the Obama Administration initiated airstrikes against ISIS in August 2014. The military offensive has yet to receive authorization from Congress.